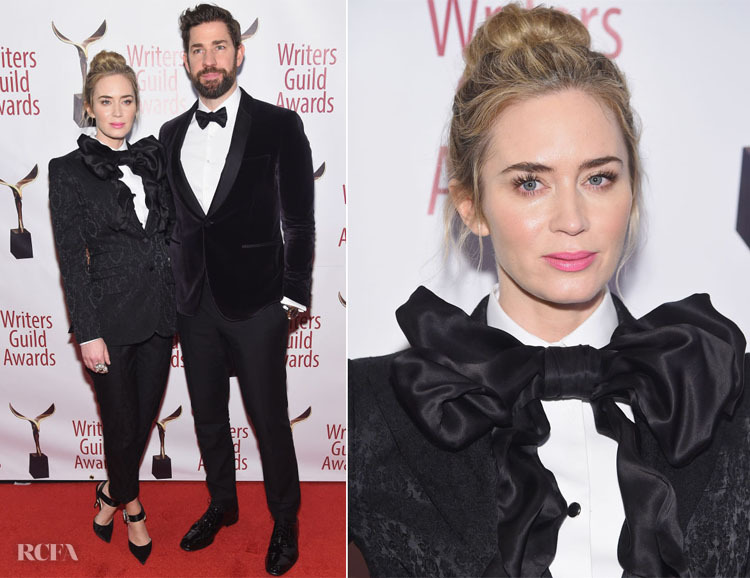 Emily Blunt and John Krasinski were twinning in black tuxedos on the red carpet for the 71st Annual Writers Guild of America Awards in New York City on Sunday (February 17). Emily Blunt: The ‘Mary Poppins Returns’ star wore a black baroque print Dolce & Gabbana suit styled with black satin Jimmy Choo heels. I love the playful addition of the oversized ruffled bow tie. This could either make or break the look for you. Which side of the fence are you on? I personally love the quirky, fun vibe it brings to the look. John Krasinski: The actor, who was nominated for Best Original Screenplay for his hit movie ‘A Quiet Place,’ wore a Salvatore Ferragamo eggplant suit featuring a lush velvet blazer which he styled with a watch from IWC. Now, had he worn that bow tie the look would’ve come off as very comical. Thankfully his red carpet M.O. was classic and elegant.